With the recent announcement of The Pagely Scholarship, we’ve been deep in a higher ed mindset and got to thinking about ways to engage alumni, in addition to current and incoming students. We spend some of the best years of our young adult lives at college. Studying. Being independent for the first time. Pulling all-nighters to get assignments in on time. Exams. Crazy parties. Societies. Sport. Making lifelong friends. Ask any alumnus where they went and they’ll usually reply not just with the name of the campus they attended, but a fond memory from their time there. Despite this ingrained loyalty, alumni engagement can be a challenge for even the most well-connected higher education institutions. In part, this is because many people consider colleges and universities little more than a relatively short stop on their chosen career paths — the strong relationships that fuelled alumni participation in the past largely dissipate over time. But keeping alumni involved in the digital age is easier than it was 20 years ago when schools relied primarily on snail mail to connect with former students. As a group, alumni are a valuable asset and resource when it comes to fundraising, recruitment, and retention. A solid alumni engagement campaign can have concrete and significant benefits. Below are 9 alumni engagement best practices that can help your institution build and maintain stronger relationships with graduates. Go on LinkedIn and you’ll noticed how many alumni from your school work for a particular company while browsing in the Jobs section. 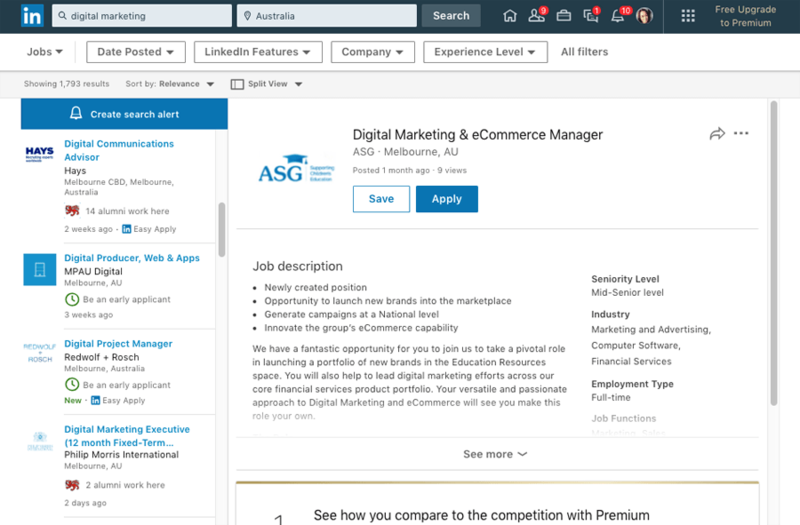 For example, if I search for digital marketing jobs in Australia, 14 alumni from the University of Tasmania where I attended have also used Hays Recruiting, while 2 work at Philip Morris International. Additionally, universities can share content and help their alumni network with each other — making the university itself an integral part of an alumnus’s career path. Twitter is a place where a brand can develop their own personality, and that’s true for schools as well. On Twitter, your college or university can use humor, pathos, or even sheer snark to build relationships with alumni. We wrote an article on how schools can better market to millennials, and lots of those same tactics ring true here today as graduating classes are filled with this same generation. You can also play it straight. Your overall social strategy will depend largely on your branding decisions. MIT, for example, may use sophisticated and so-called “nerdy” humor, whereas the University of Minnesota may emphasize a serious, research-oriented personality type. The University of Wisconsin-Madison does an excellent job of mixing useful information, highlighting the university’s achievements and making time to highlight the personality of the college. Play on nostalgia: Showing images of college students having fun, especially in groups, is a great way to play on the nostalgia factor. It won’t take much more than an image of a late night study group in everyone’s favorite dorm to bring back memories of all-nighters and camaraderie. Building on that nostalgia can help alumni make a more permanent relationship with your college or university. Amp up the youth: Sometimes, all you want is to feel young again. Showing images of youth — especially hardworking young people — can help us see ourselves in them. Sure, you might be well past 22 by now, but seeing the next generation of students succeeding at the place which helped form you into who you are today can help build a more lasting relationship. In other words, you want to choose carefully curated images that help your brand — i.e. your institution — connect with alumni on an emotional level, either through nostalgia or through some hope for the future. For example, the University of Cambridge is exceptionally fortunate to have a beautiful campus, making it easy for them to take photos and fill Instagram with gorgeous shots. But every college or campus is going to have its beautiful spaces. Find those spaces and take amazing photos, or simply re-share images that current students have posted to their account. Members of @stjohnscam graduate studentsâ society @samuelsroom having a picnic on this glorious day in #cambridge. #cambridgeuniversity #stjohnscollege #universitylife #archidaily Photo by @camdiary. Whether you’re engaging with alumni on Facebook, Instagram, LinkedIn, or any number of other social media channels, it’s important that you’re creating content that is worth sharing. In this way, social media best practices for higher education aren’t that different from any other vertical. Content is king. Share photos from alumni: This will help alumni feel appreciated, involved, and considered; therefore, they’ll be more likely to engage and retweet or share those photos. Develop content around past memorable events or annual gatherings: For example, share the most epic headliners from Spring Fling over the years, this helps to resurface those memories and reengage with graduates from years passed. Ask questions of alumni: These questions don’t have to be profound “meaning of life” type questions; you can ask simple questions about the history of the campus or about certain professors. Turn it into a game of trivia or simple, casual reminiscing about campus life. The specific content you craft will be calibrated for the brand of the higher education institution. A career college might focus more on interview tips and job boards, whereas a liberal arts college might highlight an alumni’s new publication. It’s all going to depend on your specific college or university. There are so many examples of this across a wide variety of platforms. There are blogs that highlight alumni contributions or even Twitter feeds — such as the example below from the University of Minnesota — that make a point of calling out a group of alumni doing great things. Big data has been a trend in marketing for some time now, and while its influence as a panacea is waning, there’s still significant value in collecting and analyzing user data. That can be especially true when it comes to engaging with alumni (especially if you want to maintain or leverage that engagement). Use alumni surveys to keep up-to-date information on the employment and demographic information of each alumnus. This information will go a long way towards informing your branding and digital marketing strategies. Keep detailed records on social mentions and user engagement: track which hashtags are most closely associated with your college or university, which users are most likely to follow you and what kind of posts get the most engagement. Keyword tracking: Knowing which keywords bring in the most traffic to your brand website can be especially beneficial, especially if your college or university has a specific website or webpage for alumni. Using data is really about getting to know your alumni. Thankfully, because alumni have already been through at least one aspect of your system (they did graduate, after all), you’re already going to have a certain baseline amount of data to work from. Alumni never really stop being alumni. Once somebody graduates from your institution, they will in almost all cases remain graduated. This leads to a situation in which alumni tend to belong to disparate groups. And no two groups are entirely the same. For example, you may be faced with one group that graduated in 2005 and another that graduated in 2015. It’s likely that these two groups will have entirely different ways of interacting with each other on social media–and different comfort levels as well. That means you’ll need to attenuate your message and your medium for each group for maximum effectiveness. As a reminder, for more recent graduating classes here are Tips for Higher Education Marketing to Millennials. One of the best ways to really connect with your alumni is to develop personas. A fairly common marketing practice, a persona is a kind of proxy for your most common target audience. But it’s easier (and more effective) to calibrate messages to a single person than it is to a group of people. There can be more data added to each of your personas as well. The idea is to create fictional representations of the alumni groups you’re trying to reach. A good digital marketing campaign will have at least one persona for each and every group that your campaign is trying to reach. For example, higher education marketing company Hannon Hill has created user persona templates specifically for higher education alumni groups. You might not have a persona exactly like this one, and you may have data you want to include that’s not listed here. But this template does an excellent job of illustrating what a user persona might look like. We all like to feel valued and appreciated. And sometimes our best contributions to the world aren’t in the same arena as our college degrees. You might have a Bachelor’s in mathematics and chair an art program at the same time. Sometimes, you can improve your engagement efforts with alumni by treating them as more than their major. In alumni publications and social media posts, you can (and should) draw attention to what alumni are doing beyond the scope of his or her studies. This shows an amount of care towards your students and alumni beyond their degrees and engenders a certain amount of authenticity that alumni (especially younger alumni) are more likely to engage with. Plus, it goes a long way to show how your institution helps shape well-rounded graduates. Highlighting the career of an alumnus. Showcasing work for a nonprofit or charity that an alumnus has performed. Spending time discussing the hobbies and passions of various alumni. Take Binghamton University, for example. 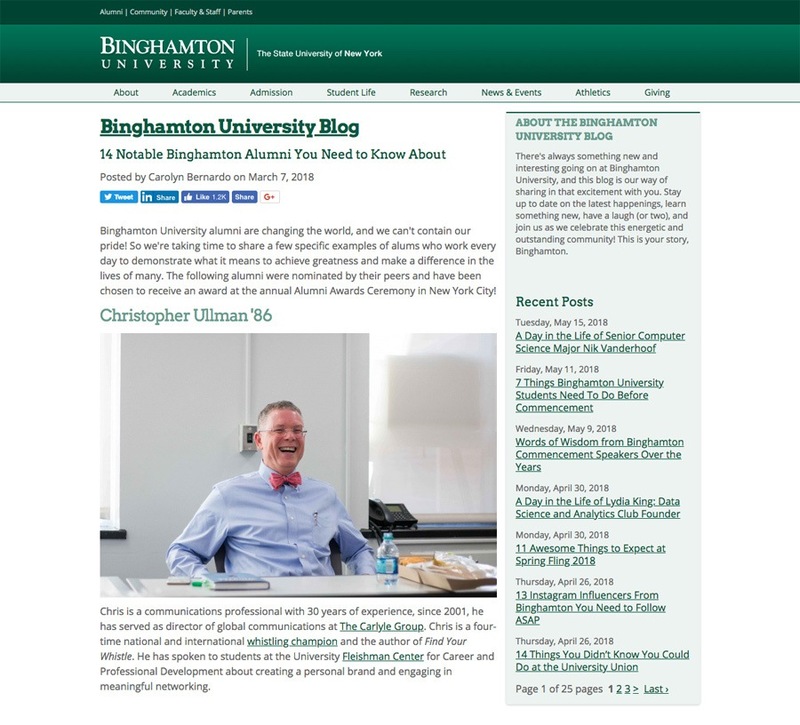 The institution created a blog post featuring 14 notable alumni from their institution. This type of post is relatively easy to put together. But Binghamton went the extra mile to highlight the people as well as the majors those people graduated with. Almost all digital marketing campaigns these days rely at least in part on some user-generated content. Sometimes this can be as simple as having a comments section. For other campaigns, user-generated content can be carefully calibrated. But it’s largely successful because few people know what users want better than the users themselves. Asking alumni to share their favorite photos from their college days. Contests in which users submit jokes or trivia questions about the school or their graduating year. Asking alumni to discuss their current employment successes. Polls for the naming of a new building or area on campus. Asking alumni to submit their favorite memories or places on campus. Networking involving alumni or encouraging alumni to share job-hunting tips. The list of user-generated content could continue for quite some time. The point is that this content is not necessarily created by the college or the marketers (though both parties do apply some guidance on the generation of the content). User-generated content can be some of the most authentic-feeling content on the web because it’s defined specifically by those it benefits. In the case of a college or university, user-generated content lets the alumni take the wheel and direct the development of the narrative and the content. 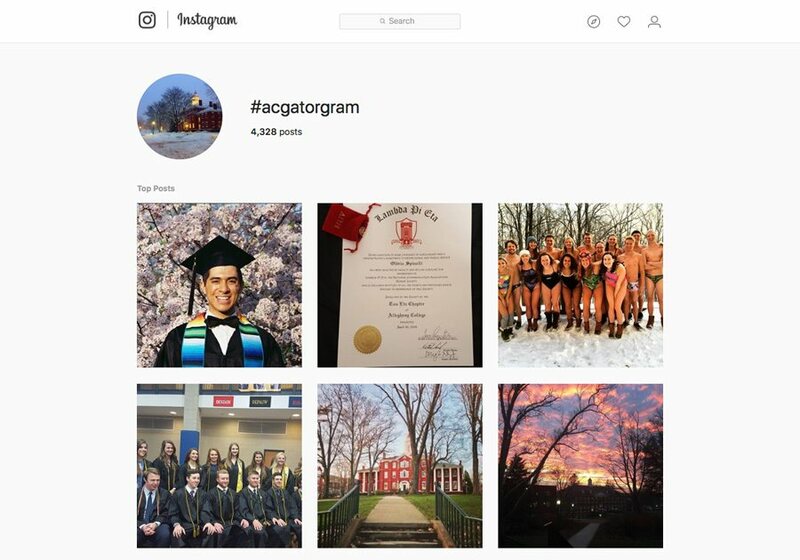 Allegheny College, for example, created an Instagram hashtag, #acgatorgram, posted signs around the campus notifying students of that hashtag, and asked students to share photos of student life. The resulting photo feed creates a captivating array of photographs that do a great job of authentically representing (and advertising) life on campus. Every year, I get an alumni magazine in the mail from the university where I studied as an undergraduate. And I’m sad to admit those magazines sit in a neat stack at home, unopened. I might flick through them one day, but it doesn’t mean I don’t engage with the school I attended. As a Millennial, Facebook, Instagram, Twitter and LinkedIn are my social platforms of choice — and where I go to see what’s happening at the university that helped shape me and my career. A comprehensive engagement campaign will incorporate each these social media platforms as well as other mediums preferred by different age groups. Ultimately, every college and university is going to be somewhat different. You have to use what will work for your alumni. But keep the 9 tips above involved and you should have no trouble keeping your alumni engaged.